Maya 44 XTe - Tracer Technologies Inc. The MAYA44 XTe is a high quality 24-bit / 96 kHz 4-in / 4-out PCIe audio interface, providing a number of powerful and amazing features optimized for home recording on a professional quality level and for various DJ applications. 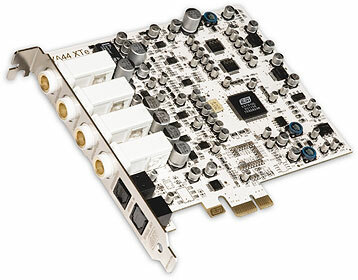 The card can easily be used by home users making their first steps in computer audio as well as by professionals who produce music on a budget, looking for a professional, yet affordable, PCIe audio solution. The MAYA44 XTe provides 2 stereo analog line inputs, 2 stereo line outputs, a microphone input with +48V phantom power and preamp, a Hi-Z guitar instrument input, a headphone output, as well as an optical S/PDIF output and an optical S/PDIF input. It comes with a powerful software package that allows you to start using the hardware right out of the box. The main item provided on a separate DVD is Cubase LE 5 from Steinberg that runs perfectly under Windows XP, Windows Vista, Windows 7 and Mac OS X. The music production system sets a new standard for integrated music production software by combining powerful audio and MIDI recording, synthesis, editing, mixing and effects. Under Windows Vista, Windows 7 and Mac OS X, MAYA44 XTe can be used in 32-bit and 64-bit environments. In addition to the main software, MAYA44 XTe also ships with various plugins including the LFX 1310 multi FX effect plugin from Luxonix, Tassman ESI from AAS, the ESI Bovbjerg Piano, the ESI Atti-Tube bass guitar amp simulator, the ESI FX pack with 7 different effect processors, the Studio Devil BVC guitar amplifier from Gallo Engineering and a few other third party plugins. Here are additional specs for those of you who love details. Most of these specs come directly from the manufacturers.